I haven’t done an outfit post lately but man, winter is tough y’all! Like – 7:15a the sun comes up and is when I try to leave my house at (note: try). Until the past couple of weeks, it would be dark when I got up and left, and dark when I left the office. Winter is the pits yo. But slowly, over the past few weeks, the sun’s been out by the time I leave between 4:30 and 5 pm. The hints of orange and blue over the river peek in through the bathroom windows as I’m getting ready, and signs that spring is a mere 54 days away makes my heart dance with joy. I haven’t done much shopping but when this top came back in stock, I had to grab it – on clearance and 50% off?! Heck yeah! Kind of boring with the black pants but what can I say, I’m a little basic when it comes to my work wardrobe. The top itself is a little outside my comfort zone – I wanted the plaid one initially because [insert heart eye emoji here] but really, I sometimes/often associate plaid with Christmas and we’re past that. So red it was! 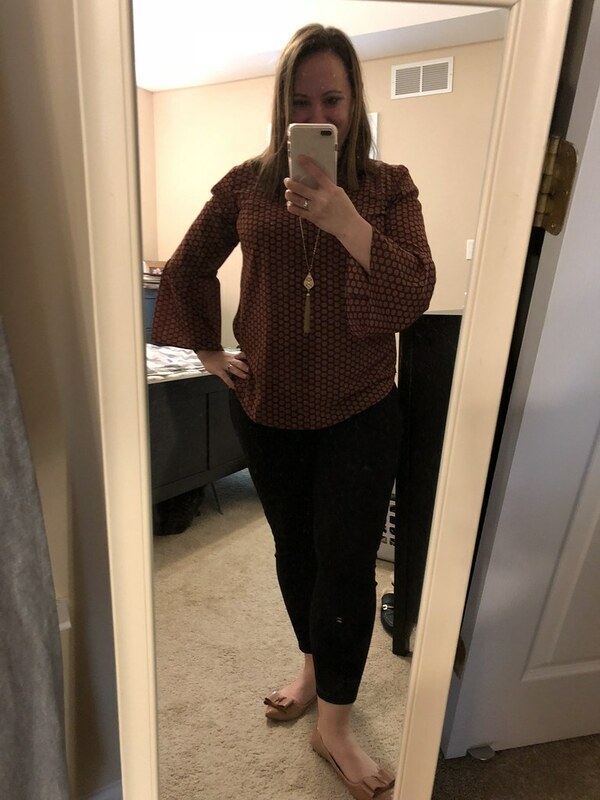 The bell sleeves are cute without being over the top, and the color is a nice pop. Plus it’ll be really pretty in the fall when it’s too warm for a jacket but not warm enough for short sleeves. This post uses affiliate links. Thanks for supporting my blog!